Through face-to-face contact, or by any other means, including on any other website or any third party, including our sponsors and/or presenters. Our website typically collects two kinds of information about you: information that you provide which personally identifies you; and information that does not personally identify you which we automatically collect when you visit our website. Personally Identifiable Information (PII): Our definition of personally identifiable information includes any information that may be used to specifically identify or contact you, such as your name, address, e-mail address, phone number, etc. As a general policy, the use of LeslieCarolBotha.com content does not require personally identifiable information; however, personal information may be required to access specific area such as white papers, case studies, paid course materials, etc. Identity Data: may include your first name, last name, username. Non-Personal Information: Our definition of non-personal information is any information that does not personally identify you. We also automatically collect certain non-personal information about your equipment, browsing actions, and patterns when you access our websites. This information can include, among other things, IP addresses, the type and version of browser you are using, the operating system and platform and other technology on the devices you use to access our sites you are using, the domain name of your Internet service provider, browser plug-in types and versions, time zone setting and location, the specific areas of the website that you visit , including traffic data, location data, logs, and other communication data and the resources that you access and use, and the duration of your visit. From third parties, for example Facebook. Information that you provide by filling-in forms on our Website. This includes information provided at the time of registering for an event, purchasing a product from us, or requesting information about any product or service. We may also ask you for information when you enter a contest or promotion sponsored by us and when you report a problem with our Website. Details of transactions you carry out through our Website and of the fulfillment of your orders. You may be required to provide financial information before placing an order through our Website. If you are purchasing an item, we may request financial information. Any financial information we collect is used solely to bill you for the item you purchased. If you purchase by credit card, this information may be forwarded to your credit card provider. We will also collect such additional personal information as you choose to share with us, such as photos or other content you may post, including, as you may elect to post, social media handles, links to Facebook groups or Google Groups, and other social platforms (“Posted Content”). You may not post (i) your own or third party email addresses, telephone numbers, physical addresses; or (ii) personal information of third parties. To fulfill the purpose for which you provide it. If you send us an email address we may use your personally identifiable information to respond to questions or comments, provide requested information, and to send marking information. In certain instances, we may provide you with the option to set your preferences for receiving email communications from us; that is, agree to some communications but not others. 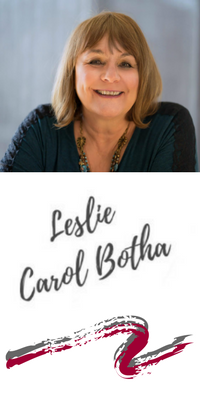 You can ask us to stop sending you marketing messages at any time by following the opt-out links on any marketing message sent to you OR by emailing us at billing(at)lesliecarolbotha.com at any time. Where you opt out of receiving our marketing communications, this will not apply to personal data provided to us as a result of a product/service purchase, warranty registration, product/service experience or other transactions. Customizing Our Website. We may use the Personally Identifiable information you provide to us along with any computer information we receive to customize our Website. Transfer of Assets: As we continue to develop our business, we may sell or purchase assets. If another entity acquires us or all or part of our assets, the personally identifiable information and non-personal information we have about you will be transferred to and used by this acquiring entity. Also, if any bankruptcy or reorganization proceeding is brought by or against us, all such information may be considered an asset of ours and as such may be sold or transferred to third parties. With your consent, for example, testimonial purposes. If we believe disclosure is necessary or appropriate to protect the rights, property, or safety of LeslieCarolBotha.com, our customers, or others. This includes exchanging information with other companies and organizations for the purposes of fraud protection and credit risk reduction. in an emergency to protect the health and safety of our website’s users or the general public. EU Residents: If you wish to exercise your “right to be forgotten” and have all Personally Identifiable Information deleted, please email us directly with your request: billing(at)lesliecarolbotha.com. You maintain the right to complain to the Data Protection Authority in your local EU Member State under the GDPR. For further information on how data protection and the Rights of European Citizens affects what you do online and how your information may be used, please visit this link, https://ec.europa.eu/info/law/law-topic/data-protection/reform/ Your California Privacy Rights: California Civil Code Section §1798.83 permits users of our Website that are California residents to request certain information regarding our disclosure of personal information to third parties for their direct marketing purposes. To make such a request, please send an email to billing(at)lesliecarolbotha.com. Our website may link to or contain links to other third party websites that we do not control or maintain, such as services or products referenced on our website. We are not responsible for the privacy practices employed by any third party website. We encourage you to note when you leave our website and to read the privacy statements of all third party websites before submitting any personally identifiable information. We have implemented security measures we consider reasonable and appropriate to protect against the loss, misuse and alteration of the information under our control. Our security program is appropriate to the size, scope and type of our business, the resources available to us, the amount of stored data and the need for security and confidentiality of the personal information we store. In addition, we limit access to your personal data to those employees, agents, contractors and other third parties who have a business need to know such data. They will only process your personal data on our instructions and they are subject to a duty of confidentiality. Please be advised, however, that while we strive to protect your personally identifiable information and privacy, we cannot guarantee or warrant the security of any information you disclose or transmit to us online and are not responsible for the theft, destruction, or inadvertent disclosure of your personally identifiable information. We will only retain your personal data for as long as necessary to fulfill the purposes we collected it for, including for the purposes of satisfying any legal, accounting, or reporting requirements. The exact data retention period varies based on the system storing the information, the date of the user’s last activity or interaction with the company, and whether or not the information relates to a current or past customer. We do not store your PII. All of your PII, including payment transactions, go directly to a third-party site, such as PayPal, Infusionsoft.com. We do not specifically market to or knowingly collect personal information from children under 18 for marketing purposes. Because some information is collected online, it may not appear to be the personal information of a child under 18. If a child under 18 submits personal information to us, and we learn that the personal information is the information of a child under 18, we will attempt to delete the information as soon as possible. If you are under 18, please do not register for any of our services or provide us any information about yourself (such as your name, email address or phone number). This policy was last updated August 2018.